Today was Day #5 of Chocolate Beverage Week. 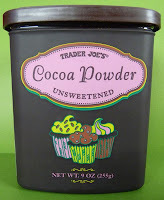 I've been cutting back on sugar lately, so I opted to make a cocoa beverage from Trader Joe's unsweetened cocoa powder. 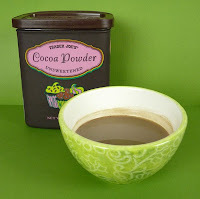 Provided you are patient and spend the required time stirring and dissolving this powder into your liquid or milk of choice, you should have minimal cocoa "sludge" at the bottom of your cup or mug. This cocoa powder was made from "100 percent Tamaco Cocoa beans," and had a slightly bitter taste; however, a swizzle of agave syrup can help transform this bittersweet beverage, into something just right -- not too sweet, but sweet enough.